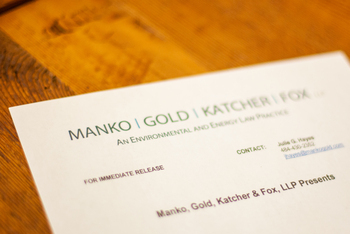 Philadelphia, PA (April 30, 2009) – John Kirk, CLM, Director of Administration at Manko, Gold, Katcher & Fox, LLP (MGKF), an environmental, energy and land use law firm in Bala Cynwyd, PA, will co-present "Going Green: What Does It Take? What Does It Mean" at the Association of Legal Administrators (ALA) 38th Annual Educational Conference and Exhibition in New Orleans on Tuesday, May 19. The four-day conference will take place at the New Orleans Morial Convention Center in New Orleans, LA, from Monday, May 18 through Thursday, May 21.